Predeceased by her Parents; Aime' and Deliane Lessard. Sister; Claire (Andy) Kiliszek. Survived by her loving husband of 51 years in marriage; John B. Geery Jr., Daughter; Ann Geery, Son; Steven (Maureen) Geery. Her extended Son; Michael (Beth) Smith. Sister; Marguerite (Richard) Shopland. Brothers; Michel (Louise) Lessard, Roger Lessard. Grandchildren; Brandon, Johnathan, Shannon; Great Grandson Bentley; brother in law Edward Geery; several, aunts, uncles, nieces, nephews, cousins and many dear friends. Monique was raised as a child in Sherbrooke, Quebec, Canada, migrating to the United States in 1950's. She worked at Rochester's big two employers, Eastman Kodak and Baush and Lomb. She also was employed by the famous Fanny Farmer Candy Factory, and Wegman's Midtown Plaza were she met her husband John. 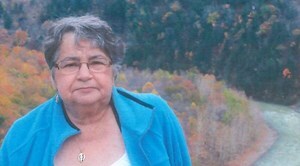 She loved spending time with her family, knitting, sewing and crocheting and her flower garden. A collector of Lenox Carousel Collection. John loved his locomotives, Monique her horses. Monique was active with John assisting him with his Model Railroad Club, painting scenery and other various jobs. She made a beautiful scenery for FCTT Hirailers Club that is still being talked about. She will be missed by so many. Friends may call 4-7pm Tuesday February 12,2019 at Newcomer Cremations and Funerals, 2636 Ridgeway Ave. (corner of Long Pond Rd.) Funeral services 10am Wednesday February 13, 2019 in the chapel of the funeral home. Interment Holy Sepulchre Cemetery. To leave a condolence and to sign Moniques guestbook, click the above link, "view guestbook". In lieu of flowers, friends may make contributions to: UR Medicine – Golisano Children's Hospital, 601 Elmwood Ave, Rochester, NY 14642 or to: Ronald McDonald House, 333 Westmoreland Dr, Rochester, NY 14620 in memory of Monique. Add your memories to the guest book of Monique Geery. My deepest sympathies to you, Ann, and your family. This is not an easy time but please find comfort in others that share your grief. My condolences and Prayers to her family. May they find comfort in each other as they go through this difficult time. Monique was my second mom, she was a loving, caring lady who wasn't afraid to 'let you have it' if we got out of hand! I'm honored and my life has been made better by knowing her. I'll miss you mom.